The Queen, who will become the country’s longest serving monarch on September 9th, has just delivered her 62nd Queen’s speech. The last time she did so for a Conservative-only Government was in the mid 1990s when John Major was in power. The speech, in which the Monarch sets out the government’s programme for the next year, is a ceremonial occasion, in which the Queen sits in the House of Lords and MPs walk through from the Commons to watch and listen should they wish to (some particularly left-leaning MPs like Dennis Skinner make a show of refusing). Not ALL of the government’s programme is actually read out; the Queen noting that “other measures will be laid before you”, so we didn’t hear everything, but we heard plenty. The key is that the House of Commons then votes on the speech having debated it, which is why this day was targeted by the ‘anti-Tory’ majority that was supposed to exist now as the day they would vote down a Tory government. That can’t happen now, at least not by a combination of the other parties in the Commons, as the Tories have a majority. BUT, it is small enough that they were only able to put in this bill the proposals that all Tory MPs would be prepared to vote for. That is why one of most controversial parts of their manifesto was considerably watered down in the speech just given. The manifesto had included a commitment to pull the UK out of the European Court of Human Rights and create a British Bill of Rights, which would contain more or less the same provisions, although that wasn’t guaranteed. There was always a suspicion before the election that this was one of the policies the Tories would have been prepared to give up in coalition negotiations with the Lib Dems, but was in there as suitable red meat for Eurosceptic Tories and wavering Tory voters tempted by UKIP. Enough Tory MPs had made it clear that they would not vote for this move at the moment, including some ministers, that the Tory leadership has visibly climbed down, saying in the Queens’ speech that the government will “bring forward proposals for a British Bill of a Rights” which is politics-ese for kicking it into the long grass for a while whilst still making some moves on it. It removes the one obstacle there was to all Tory MPs voting for the Queen’s speech, which was an obstacle to this Government being officially established. Still, there was plenty on the speech for Parliament to chew over. The ‘Snoopers Charter’ will be implemented, which is the name given to controversial government proposals to monitor communications a lot more closely for possible extremism. The ‘tax lock’ was there, which binds the government not to raise VAT, income tax or a National insurance over the course of Parliament. The commitment to take all those working 30 hours on minimum wage out of income tax was there too, as were moves to increase the amount of free childcare, working towards the eventual target of 30 hours. The EU referendum was committed to as expected, and Scotland got a promise of further devolution, linked to “fairer procedures” for English MPs in the House of Commons. Then there was the extension of right-to-buy legislation for housing association properties, which will have to get through legal challenges from those housing associations as well as some vital questions on how it won’t cause an even bigger problem for affordability of properties. Also, there was the tightening up of procedures and thresholds for unions to be able to go on strike, with turnout minimums for many unions and actual percentage of union members voting yes for the “vital” public services. 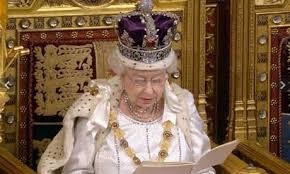 So, despite their majority, this may not be the smoothest ride a Conservative Queen’s speech has ever had.